ESC-Toy and Naughty Dog have a surprise for you. Uncharted 3 figures of that rogue Nathan Drake that stand at 7" and are $4.99. 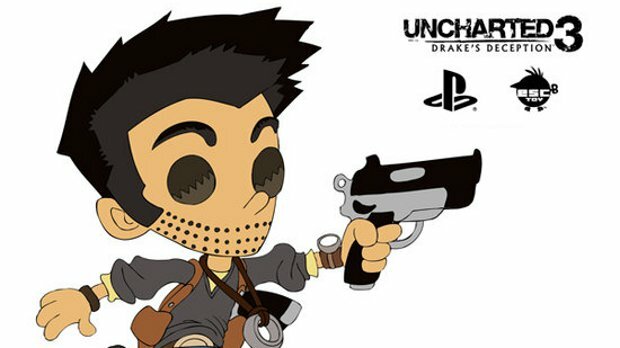 There are two color variants, a normal Nathan color scheme, and a red and black Naughty Dog one. Both are available for pre-order if you are interested. If you are thinking about getting one, or both, but aren't sure, the ND version has a limited release of 500 figures. As an added bonus, anyone who pre-orders either version will get a code for exclusive DLC to use in Uncharted 3, though no details were given on what the code unlocks. The only reason I would hesitate to get one of these figures is that the preview pictures are drawings, not actual product images. I generally like knowing what I'm getting before I put down money.